In this issue of Rouleur : American star Taylor Phinney’s season was wrecked by a crash, just as he was ready to rock the summer races. We get to know the boisterous man from Boulder as he fights back from adversity. After 40 years of illuminating the Tour de France, race speaker Daniel Mangeas is bowing out. The voice of cycling reflects on his colourful career and shows Rouleur round his Brittany home. What goes into a successful time-trial? Alex Dowsett, Steve Cummings, Michael Hutchinson and Taylor Phinney discuss this fine art. Also featuring long lost film from the 1966 Milk Race, the Quintana family and other broods sacrificing everything for cycling success, Planet X and the Holdsworth rebirth, and Duncan Forbes’s photographic history of crashes. Plus columnists Robert Millar, Matt Seaton and Johnny Green. 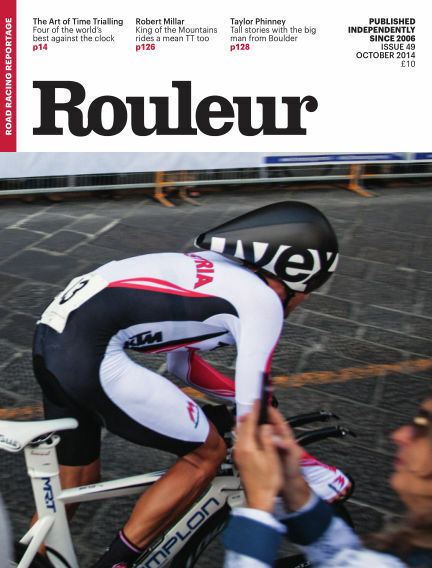 With Readly you can read Rouleur (issue 49) and thousands of other magazines on your tablet and smartphone. Get access to all with just one subscription. New releases and back issues – all included.